How to clean your computer screen? Easier than you think. I have tried any number of screen cleaners, sprays, pre-moistened wipes and home remedies for cleaning my laptop screen and at last I found one that actually uh…cleans. Go figure. When the sigOth showed up with a package of Windex Electronic Wipes for our TV this week, I grabbed one and went to work on my disgusting MacBook Pro laptop screen. (Why oh why do children these days assume every screen is a touch screen?) Voila–it’s like I have a whole new laptop. No streaks, no smudges, no nothing. Just my pretty, pretty screen. I can’t account for the negative reviews on Amazon considering our Samsung TV looks pretty great too after using the wipes as does my iPhone. The only sense I have is that it’s not for dusting; dust first, wipe second. Maybe? All I know is, I’m sold. Cross one New Year’s resolution off my list. 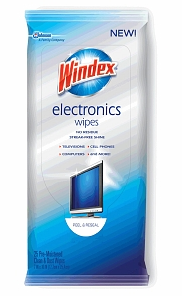 Find Windex Electronic Wipes online at our affiliate Amazon or in hardware stores and drugstores everywhere.